Because you can run your whole development, testing, and production setup in OpenShift itself, the pipeline from code to production is self-contained and simple to manage. As demand for these services shift within your environment, you can easily scale each service (including Artifactory) independently to maximize resource utilization and performance. This triggers a build on Jenkins which fetches the artifacts it needs from Artifactory. Once the build is complete, and it passes acceptance criteria, it is promoted and deployed to Artifactory. From Artifactory, your build can be deployed further into the OpenShift cluster. OpenShift can be configured to detect any changes and automatically deploy the latest build to the cluster based on promotion policies. Artifactory Enterprise offers a variety of important capabilities like cloud-based object storage, filestore sharding, multi-push replication and more, and can also be deployed as an HA cluster that provides up to five-nines availability. 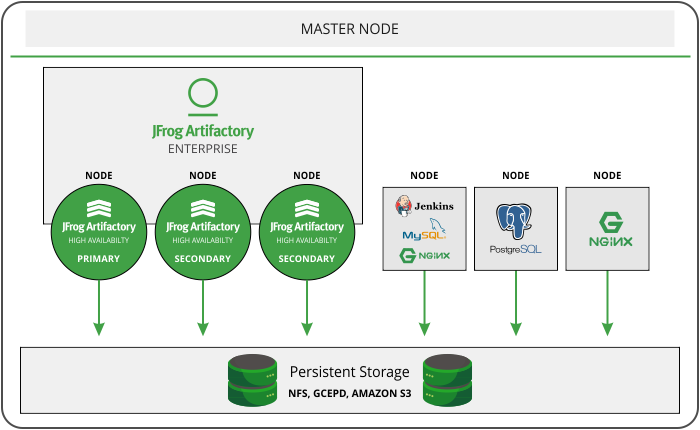 In our solution, JFrog Artifactory is deployed as Pods across multiple compute nodes and connects persistent storage via infrastructure specific APIs (such as Amazon Web Services S3 or Google Cloud Storage). Right now, the integration of Artifactory into OpenShift is still in testing, but we expect it to be released for general availability during Q3 of 2017. Once released, Artifactory Enterprise will be one of the standard templates available on OpenShift. Feel free to download and install a demo version of this integration from our GitHub repository.